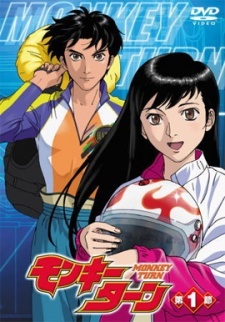 Based on Kawai Katsutoshi's manga of the same name, published in Weekly Shounen Sunday, Monkey Turn is a sports anime based around professional speed boat racing. The anime's protagonist, Tadano Kenji, is too short to follow his dream of becoming a professional baseball player, but his baseball coach recommends him to boat racing. One day Tadano-san unexpectedly meets his old girlfriend and they exchange promises: in return for her being faithful to him, he is charged with becoming Japan's best racer within three years. The eponymous "Monkey Turn" is a boat maneuver Kenji-san thought up while visiting his girlfriend. The Monkey Turn gives Kenji quite the advantage over other boaters, but is it enough for him become the best?